I’ve always thought it a blessing that I was raised on a farm and, from my youth, had inculcated into me fundamental principles of common sense. And not just on seemingly minor issues like not pushing a stuck pickup out from right behind the back tires, or even greater issues like not raising a sprinkler pipe near power lines. But with even larger issues that have ramifications in many facets of life, like, don’t tear down a fence until you know why it was put up. According to National Geographic, wolves are apex predators, which means they’re at the top of their food chain. Their primary diet consists of ungulates, or hoofed mammals, including horses, goats, pigs, sheep, moose, elk, deer and antelope. They also attack and kill other predators within their territory to diminish competition for their food source, including domesticated dogs. Since they typically travel in packs of 5-10 they can rip through a deer or elk herd with ferocious rapidity, and not even eat all that they kill. For wolves not only kill for food, they kill for sport and often take just enough of a bite out of an unsuspecting fawn to kill it and then quickly move on to the next kill. As apex predators, the only real natural enemy of the wolf is man. And man, across several continents, collectively engaged in the eradication of the wolf because it was a menace and a threat not just to domesticated livestock and wildlife, but a threat to humans as well. Congress actually funded the process of eradication into the 20th century. This eradication, applying my farm lessons, was the fence erected for safety and security. That was common sense. Then came the 1960s and 70s, and true to the recalcitrance, illogic, and dearth of common sense of the era, the fence started to be torn down. 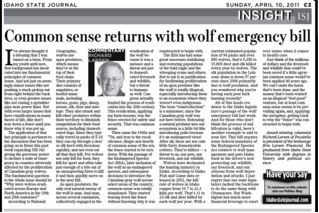 With the passage of the Endangered Species Act (ESA), later inclusion of the wolf as an endangered species, and subsequent decisions to introduce the Canadian Gray Wolf across select areas of the country, common sense was totally abandoned. They started tearing down the fence without knowing why it was constructed to begin with. The ESA has had some great successes stabilizing and restoring populations of the bald eagle and the whooping crane and others. But to use it as justification for facilitating proliferation of an apex predator like the wolf is totally illogical, especially introducing them to an ecosystem where they weren’t even indigenous. The term “reintroduction” is a misnomer, since the Canadian Gray Wolf was not here before. Releasing a natural predator into our ecosystem is a little bit like introducing polio because it’s an endangered virus! After all, these are not cute little furry domesticable critters; they’re killers, a threat to us, our pets, our livestock, and our wildlife. Wolves have decimated the hunting industry in Idaho. According to Idaho Fish and Game data released in 2002, the kill rate of wolves in Idaho ranges from 10.7 to 23.3 kills per wolf. That’s 11 to 23 elk and deer killed by each wolf per year. With a current estimated population of 94 packs and over 850 wolves, that’s 9,350 to 19,805 deer and elk killed every year by wolves. Elk population in the Lolo zone alone is down 57% since 2006 primarily due to wolf predation. And you wondered why you’re having such poor luck hunting recently! All of this lends credence to the legislature’s passage of the Wolf Emergency bill this week. And for those who don’t think the process of nullification is valid, here’s another example to add to your list. This bill negates some federal mandates of the Endangered Species Act relative to wolf management and puts Idaho back in the driver’s seat protecting our wildlife, our livestock, and our citizens from wolf depredation and attacks. I just regret that our state legislators lacked the backbone to do the same thing with Obamacare. But Washington has much more financial leverage to exert over states when it comes to health care. Just think of the millions of dollars and the livestock and wildlife that could’ve been saved if a little agrarian common sense would’ve been applied 40 years ago. We can’t undo the harm that’s been done, and the money that’s been wasted on an illogical “feel good” venture, but at least common sense seems to be prevailing again, and, applying the metaphor, getting back to why the “fence” was constructed to begin with.